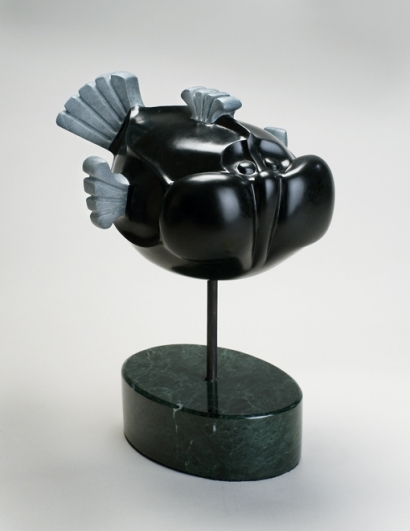 “Fish Out of Water” is a biographical stone sculpture. This is how I felt when I first moved to Loveland, CO–truly a cartoon fish out of water. My husband, Brian, and our 3 cats moved to Loveland, CO, in early October, 2005. I stayed behind in California waiting for escrow to close on the house and followed in early November. I remember asking Brian for directions to the grocery store and having a tough time finding my way back to the house.I had no identity yet as a sculptor, and remember thinking there probably wasn’t an animator within 300 miles of where I was. The fish is me holding my breath, hoping for acceptance in my new town and my new profession. Comments/replies will be reviewed and moderated by Ellen. Comments with excessive embedded links to other websites may be flagged as spam. Please allow a couple of days to see comments posted. Thanks.